Jan 19, 2019; Syracuse, NY, USA; Syracuse Orange forward Marek Dolezaj (21) shoots during the Orange's 74-63 win over Pitt at the Carrier Dome. Mandatory Photo Credit: Kicia Sears, The Juice Online. Syracuse will try to rebound from an ugly loss at Virginia Tech when they travel to Massachusetts to play Boston College on Wednesday evening. Ahead of the game, The Juice Online’s Steve Auger and Wes Cheng give their predictions below. STEVE AUGER: If Syracuse was ever in need of a rebound game this season, its trip to Boston College certainly presents such an opportunity. The Orange were run out of the gym on Saturday by a Virginia Tech squad that dissected the 2-3 zone as if they invented it. Syracuse surrendered 35 points – on 9-of-13 shooting from beyond the arc – to Justin Robinson and had twice as many turnovers (14) as assists (7). Even more astonishing was that the Hokies shot almost as well from three (46.7 percent) as The Orange shot from the charity stripe (50 percent). Boston College is fresh off a win at Wake Forest that saw Ky Bowman sink the decisive bucket that would win most games or H-O-R-S-E. Despite Bowman’s heroics, the Eagles have struggled this season. The big blow was the expected departure of Jerome Robinson to the NBA. Paired with Bowman, the due formed a lethal scoring combination last season. Nagging injuries have also played a role as well. Only Bowman and two freshmen – Jairus Hamilton and Chris Herren, Jr., – have played in all 18 games. Bowman is certainly the straw that stirs the drink for BC. The junior leads the Eagles with 20.5 PPG, 8.1 RPG, and 3.6 APG. And the North Carolina native also connects from three at a rate of 36.4 percent. Guard Jordan Chatman will certainly be heard from as well for BC. The senior averages 13.4 PPG on the season while making 36.8 percent from three. Chatman has been red-hot in his last three games from beyond the arc as he’s made 16-of-25 attempts. Despite BC’s struggles, Syracuse will need more than just solid outings from Tyus Battle and Elijah Hughes. The Orange will need the good Frank Howard to drive to the hoop, limit turnovers, and knock down some timely threes. Oshae Brisset and Paschal Chukwu will also have to control the backboards against BC. Syracuse entered the season with lofty expectations. But at this point in the season, the Orange seem to be a team capable of winning at Duke and losing at home to Georgia Tech. Syracuse will get just enough scoring punch from a combination of Battle, Hughes, Howard, and Brissett to wash the VaTech taste out of their mouths while escaping BC with a win. Syracuse, 77-71. WES CHENG (Season Record: 5-3): Boston College has had its struggles this season. After jumping out to a 9-2 start, the Eagles were stunned by Hartford in their last non-conference game. It was the start of a five-game losing streak, which included road losses to Louisville and Notre Dame, and losses to the upper echelon of the ACC in Virginia Tech and Virginia. The Eagles have since rebounded with wins over Wake Forest and then-No. 11 Florida State. The Eagles do two things well that should concern Syracuse. The first is that they can shoot the 3-pointer. Four different players shoot 32 percent or better from downtown. BC also takes care of the ball, averaging just 12.0 turnovers per game. Bowman, for his high-usage rate, averages 3.0 turnovers. 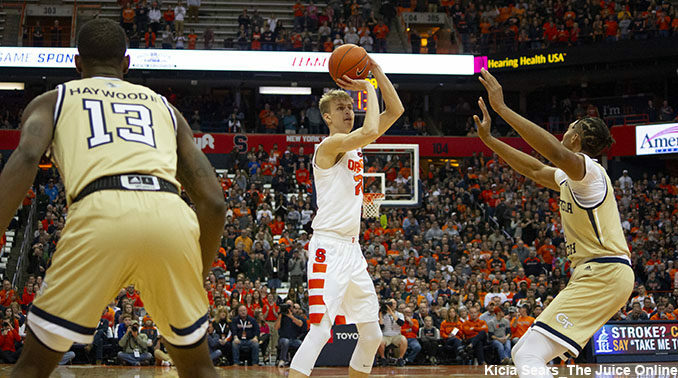 There are no such things as gimmies in the ACC, and even if Syracuse is given a 65.4 percent chance to win in the ESPN matchup predictor, the Orange is coming off a shellacking on the road and is in the second game of a three-game road trip. It’s going to be close, and the game won’t be decided until the final 30 seconds, where I expect Syracuse to pull away for a win. Syracuse 74, Boston College 69.